I want to make something abundantly clear — I 100% feel that the responsibility to raise decent human beings is an obligation of parents. I do believe that the majority of parents are good parents and in fact, great parents. Respect, values, fair treatment of others, etc. should all be taught at home but sadly, in today’s world many children are missing these lessons. Is the answer for other students and their parents to just accept or is it to look to the school board and administration? As I say, where do we go from here? Bringing awareness to the situation with discussion is important. No one wants to see a racial video go unchecked and the situation escalated! I am president of the African-American Student Union at Conestoga and I just wanna thank you for taking the time to spread awareness to this issue. Thank you Heather. Words DO matter. 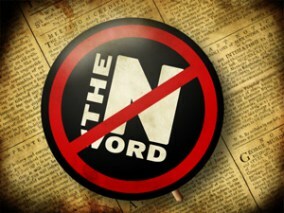 The “N-word” has no place in our schools or work places. It was disrespectful and stupid for these girls to say what they did, but stupidity is not a crime. But I will believe African Americans are serious about quashing the “N word” when it no longer one of the primary lyrics of gangsta rap and removing it from the common vernacular. Otherwise, this is all just posturing and playing activist. I have recently moved to TE and do not have children in the school district so appreciate knowing what is going on. The girls will have to live with the consequences of their actions. A mistake that will cost them dearly. I understand from your post that the video did not take place at school and that the administration is addressing the situation. Thank you. Correct, the video did not happen at the high school. The school district administrators are handling this situation in an open, effective way. Although the video was clearly a mistake, discussion about how ‘words matter’ is not. these girls were wrong. They acted like spoiled, entitled kids. But they are kids and make mistakes. However, they get mixed messages when it is ok for some to use the word (rappers, athletes, media, etc.) without the negative repercussions. The girls have been vilified in the schools and the local community. They have been forced to transfer schools. They have lost college scholarships and opportunities. At the end of the day, they made a mistake. A really bad one. Instead of attacking these two girls, why don’t we turn it into a learning experience and have conversations about the meaning behind the word? Sorry to hear that the girls lost college scholarships over the video. I agree that using the situation as a learning experience and dialogue about the meaning behind the word is important in moving forward. Thank you for raising awareness of this issue, and I agree we need a dialogue on race in order to help change people’s perspectives. I wish that was happening at the high school, instead of just having the students leave. I am curious why you tagged only the two members of the school board who are african american in this post? Issues like this are of equal importance to all school board members. This is an important issue and truly hope that the path leads to open and honest discussion. Racial discrimination is an important topic for all of us regardless of the color of our skin. Certainly a significant issue to all school board members; we can learn from the insight of our African American directors. We can benefit from their personal experiences, which is why I tagged them in the post. First, I don’t agree using the N word. After learning more about these two “white girls” it seems the entire story is not being “reported”. That is, they used the N word while streaming live on Instagram. An African American female recorded the stream and posted it on her Twitter account. But if the girls offended the African American girl, why didn’t she try to let them know? Instead, the rush of judgement on two “white girls”, their school district & community by the local media. A community that voted in 5 females & 2 African Americans on the school board. in fact, during last school board race, last Nov 2017, one of Kyle Boyers’ supporters labeled this Blog’s Host (PattyeB) as racist—Just because they had different opinions. The word was used to try to silence Pattye and change the narrative. A number of people, me included, rushed to Pattye’s defense. The two girls used the N word and they were wrong. The way they were caught, is a bit Orwellian. Not given a second chance…disappointing. Finally, wouldn’t it be great, to use this as an learning opportunity for everyone involved as well as go after the music industry that influences our society with their casual use of the N word and references woman as Hoes. Thank you for your comment. It was sad to read that I was labeled ‘racist’ by a supporter of Mr. Boyer. Thank you and others for your defense! We are all permitted to have our own opinion and our constitution protects our right of free speech. Absolutely agree that this should be a learning opportunity for all involved! I don’t know all the ins and outs of this situation but just a couple of observations: why would you not identify yourself if you feel compelled to comment on an event and intend to stand up for your views? It is easy to be anonymous, no accountability. Also would be keen to separate facts from hearsay ie have the students been asked to leave? Was it an African American girl who filmed them and posted online? Just wondering.. I really hope that the CHS administration comes down at least as hard on all of the students (who may have also been members of the school-sanctioned African American club) who used social media (go look on what they did on Twitter, FB, etc.) as a very public platform to destroy these two girls. As insensitive and dumb as it was, the N word comment did not appear directed at anyone in particular—unlike the actions of the African American students who specifically intended to harm these girls by posting on social media and publically smearing them. As a result, these girls lost their scholarships and had their future destroyed, hardly quid-pro-quo. I hope the parents file a libel suit against those responsible. As the distraught parent of one of girls involved in this horrible incident, I would like to share my daughter’s sincere apology which was sent to the school and the field hockey association last week, and which I have posted publicly earlier today. “I am deeply ashamed for using racist language, and there is no excuse for using such language in public or private. I realize that such words are offensive, uncalled for and, regardless of the situation, I should have known better. I take full responsibility and I apologize from the bottom of my heart to anyone and everyone who I have offended. I have begun to have conversations about how to move forward, and how to develop better sensitivity and understanding of the experiences and feelings of others. I will do whatever is necessary, including having as many conversations as necessary, to show that I am sincere in my desire to truly learn and grow from this experience. Mr. de Vries, thank you for your comment and for sharing Charlotte’s letter. As a parent myself, I cannot imagine how difficult this situation must be for you and your family. Standing by our children and loving them unconditionally is what we do, even when it challenges us. Respect, understanding and having uncomfortable conversation about race and racism is how we move forward. Words do matter and the meaning behind words is a reminder to all of us, and a lesson your daughter is learning. Patty -two sides are needed for a conversation, no matter how difficult that conversation may be. It appears that Ms de Vries has taken the first step – is she being met halfway, a quarter of the way, by anyone? Yes, you do need to have both sides involved for discussion to happen. Bringing both sides together in a ‘safe place’ for discussion, yes hope that it is happening. We can all hope , the two girls can sincerely apologize all day to everyone , but I don’t see any chance of this improving the atmosphere if there is no real, meaningful communication between both sides. I think there is too much vindictiveness at the current time. But we can always hope, life is too short to go through it with hate in your heart – that goes for both sides.But there is hope, as I hear some positive activities from the student body. Good to hear that there are ” some positive activities from the student body”. Well that’s a little late isn’t it? And, it only comes after getting caught. Americans have the freedom to say whatever they want but they also forget that there can be severe consequences. is shocked and appalled of the use of the N word and posts on her Twitter account. ReTweeted to EVERY SINGLE NEWS AGENCY in Phila. The TESD Superintendent issues a letter to EVERY PARENT in TESD. Any fair minded person would realize the girls made a mistake–a Big Mistake in using the N word. “White Privlidged Girls” ages 16 &17.
and read how many times SHE casually uses the N word. Sibling rivalry involves many fights and much more verbal put downs. When siblings fight, it’s what they do. But when someone comes along and wants to fight or put down your sibling, you will fight that “outsider.” Is that hypocrisy? The n-word is the same, only it’s literally Black & White. The history of the n-word coming from White people is not simply a “put down.” It’s a statement that the person using it thinks of the Black person as “less than” a person. It is dehumanizing. The fact that Black people use the word among themselves is not a valid argument because, just like between siblings, the “put down” is not the same; and just like defending a sibling from an “outside” attack, so too will Black folk defend each other from the same. And if you must ask why this is true, remember that for all of American history, one Black person’s bad act is attributed to the entire race and, yes, it works in the reverse. It may not be right, but calling it hypocrisy is hypocritical at best. The girls in the video made a big mistake and are paying a life-changing price for the mistake. But using all forms of social media to vilify them is not going to solve racial problems. Instead, the divide will continue to increase. I come from a multicultural, faith based upbringing in Philly/Norristown. I believe FORGIVE and REPAIR are the better methods to deal with this race event. I pray that students, parents and the community more forward with LOVE and GRACE. Racism is real and it exists here. Racism or any other discrimination is wrong. Racism needs to be discussed and honestly explained. The students may want to come together to share their experiences and suggest positive resolutions. Heroin, suicide, overdose, sexting, hazing, and hatred are SIMPLE to fix. Admit they exists. Find common grounds and practical solutions. Reach out, share, and forgive. Second chances and do overs should be common place. Students should get off social media and speak face to face in a safe place like the Diversity Committee.